You won't believe what some websites will do to get you to read their content.Actually, you probably will believe it. You probably know what they do, and you see it every day. It's the online version of "Film at 11 " that's been a trope of television news since the dawn of time.I spent more than a decade as a copy editor. I take a back seat to no one when it comes to appreciating a clever headline. But clickbait resorts to cheap tricks.One example of these are the headlines that ask yes/no questions, implying that the answer can only be found if you follow the link. "Can Starbucks succeed in Italy?" "Does water have memory?" My personal favorite: "Are testicle eating fish really coming to Britain?" According to Betteridge's Law, the answer to all of these is "No." Ian Betteridge is a British tech journalist who developed this rule in a 2009 blog post.Sometimes the answer to these question headlines is "yes." All too often, though, the headline writer is gaming the reader's curiosity in the name of cheap clicks.Clickbait headlines follow a few other patterns besides the yes/no question headline form. Learn to recognize them:The use of "you," as in: "You won't believe how much this can of tuna costs"Words that imply literal destruction about something less dramatic: "Actor annihilates haters with one speech"Headlines that play on your emotions: "These 23 kittens will warm your heart. "Sometimes you don't know until after you've clicked on the story. 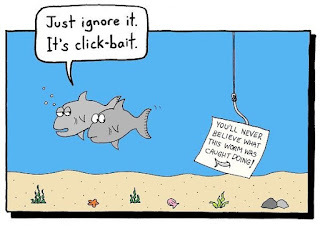 If you feel profound disappointment and anger, it was probably clickbait.Unfortunately, clickbait works. I conducted an unscientific Twitter poll this week to see if readers preferred a straightforward headline or a clickbaity one. The clickbait headline ("Are smart people from Berks moving away?) was more popular by far.The comics character Pogo was right when he said, "We have met the enemy, and he is us." Or, in modern headline parlance:"Nine words a cartoon character used to describe society and he nails it. No. 6 is epic."